On 27.08.2018 - SSC GD Website for online application form has been working smoothly. Note down: SSC GD online form will be submitted in four stages. In the first phase, you need to fill your application form by providing your basic details, contact details, upload photo & signature and additional details etc. In the second phase you are apply for the post in which you will need to provide exam centre (4 no's), apply job preferences (8 no's - all are mandatory), educational level and final submission of the application form. You must not that after the final submission, you will be provided two options as take printout or pay application fees. In the third phase you are required to pay the fees by online are offline mode. In the offline mode, you need to generate echallan by canara Bank or Syndicate Bank. The challan will be available to pay application fees within 24 to 72 hours. In the fourth phase, the candidate can get printout of application form and and check the history of application form submitted for SSC GD Constable Bharti 2018. You can also modify your application as per instruction and after paying application fees in case you are doubtful. The photograph can be used element but light background photography is preferred in the application form. The signature must be on white piece of paper with blue or black point pen. 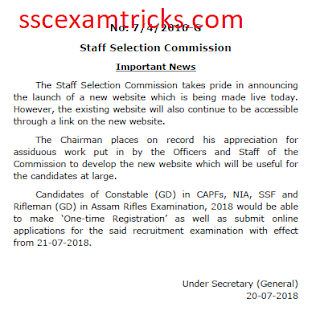 Good news is that staff Selection Commission has activated registration link for apply online application form for 56717 post of constable general duty on official website www.ssc.nic.in. Before applying online application form the candidate must have educational documents along with one ID proof such as Aadhar card, driving licence, employment ID, PAN card passport school college ID card, voter ID card etc. The oven application will be submitted in four parts. 1. Basic details - on this page, the candidate will have to enter their Aadhar Card detail father name, mother name, 10th class exam details, gender, level of education, mobile number, email ID and state / UT of permanent address off the grid with verification. Call every step the candidate will have to press save and next button given in the end of the page with green, blue, orange and sky blue colours. Note down the registration number and password of the candidate. Make the payment online for generate challan for offline payment in the bank. The last date to pay bank challan is 22 September 2018. The apply online link is given in the end Table. 2. Filling of online application form. 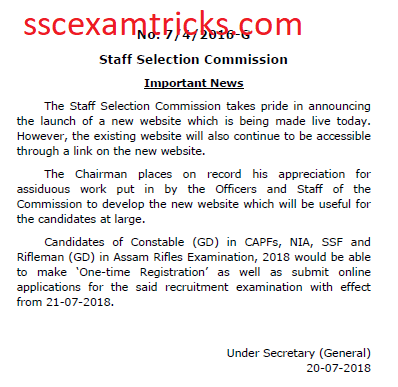 Staff Selection Commission had provided both the facilities on its new website with effect from 25th July 2018. Due to the heavy traffic the website became that's why staff Selection Commission add postponed the online application form to be apply online from 17th August 2018. The online application form can be submitted from 17th August 2018. But online one time registration can be started from 14th August 2018. The last date to apply the online application form would be 17th September 2018 up to 5 p.m.. The candidates are advised fill their online application form in of time or non peak hours like 10 p.m. to 8 a.m. In order to avoid the inconvenience to the candidates. On 29.07.2018- The apply online link has been Deactivated now. The apply online date for SSC GD has been revised again. Now the application will be opened on 17th August 2018 on official website. The revision is made due to certain technical / unavoidable reasons. Those candidates who have eagerly waiting for SSC GD Online Application Form 2018 are now required to waiting for about three weeks to re-active the link again. Note that the application fee has been revised from Rs. 50 to Rs. 100 for UR/ OBC. No fee will be made for SC/ ST/ PH/ Female candidates. On 28.07.2018- The apply online link has been activated now. On 22.07.2018 - SSC GD Constable Online Form has been delayed now. Now online form application link will be activated on 24th July 2018. The last date to apply online has also been changed from 20th August 2018 to 24th August 2018. The last date to make payment will be 28th August 2018. Check the notice to change the schedule for SSC GD 56717 Constable Recruitment 2018. On 20.07.2018 - SSC GD Constable Notice for One time registration released now. On 13.07.2018 – The online application link will be activated on 21.07.2018. Documents to be required for filling online form are discussed as below. Staff Selection Commission has released notification for recruitment of 56,717 Posts of General Duty Constables and invited application form from 21st July 2018 to 20th August 2018 on official website www.ssc.nic.in. The final selection process will be made on the basis of measuring performance in written test. The rest of information like number of posts in each category, age limit, essential qualification, application fee and important dates can be checked here as short notification prepared from the advertisement. SSC GD Result will be available very shortly after the written test. 2. Go to the Download Segment column and click on ‘Download SSC GD Result’ link given at the left bottom of homepage of website. Enter your to be registration number, DOB, Gender and verification code (displayed in the image). 3. Click on the button given as ‘Download SSC GD Result/ Merit List’. The Result/ Merit List will be available on official website of SSC.